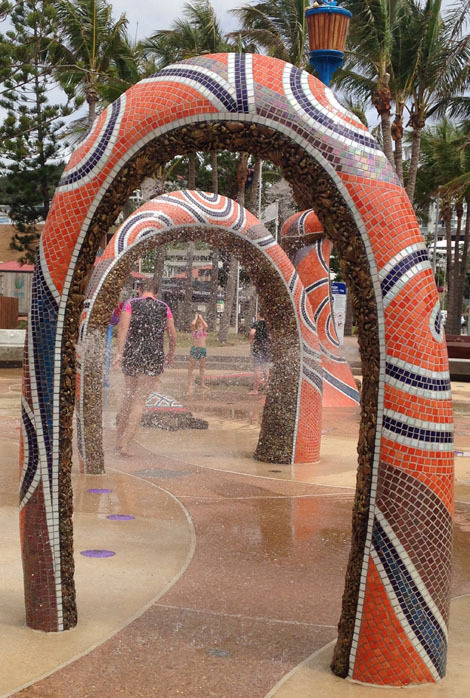 The installation of unique sea creatures in abstract sculptural forms makes this seaside sprayground in Yeppoon a ‘kraken’ good time. 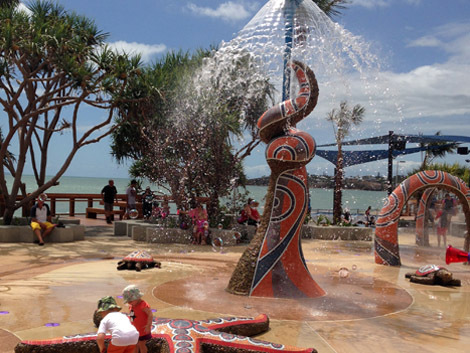 In 2015, Yeppoon City Council commissioned Natureworks to sculpt a series of sea creatures incorporating interactive water play, for the central art feature of a new ‘sprayground’ to be constructed on the Yeppoon foreshore. 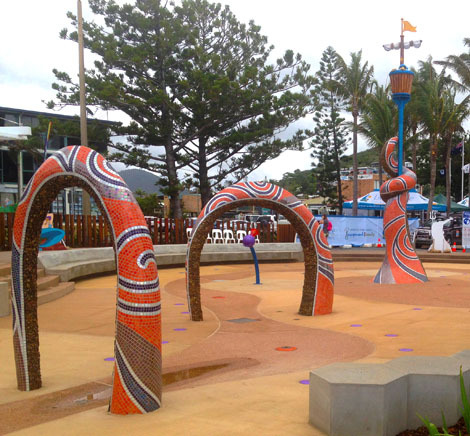 Working closely with landscape architectural firm Vee Design, Natureworks developed an abstract interpretation of Kraken tentacles (giant octopus), a stingray, a starfish, turtles and a giant crab for the new wet playspace. Utilising a range of surface finishes, Natureworks created larger-than-life artforms with precise mosaic patterns and a unique 3D bronze appliqué that hugs the free-flowing sculptural forms. The 3D micro-bronze patterned inlay utilised tells the story of the sea creatures fringing the coral reef off Yeppoon - the mid-QLD coastline devastated by Cyclone Marcia in February 2015. 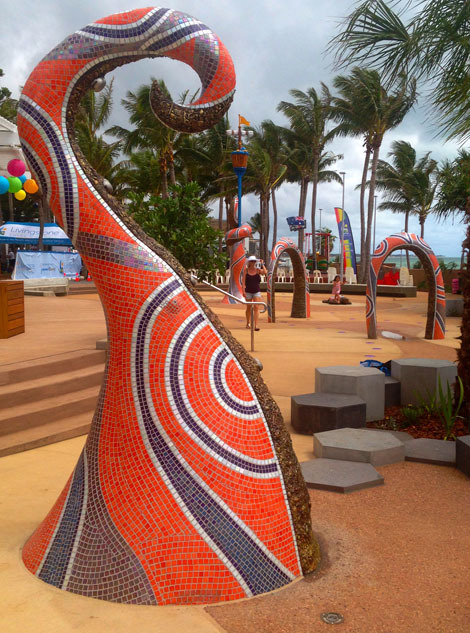 The challenge of the Yeppoon project was to produce large wet-play sculptural icons of local significance that would meet Australian Playground Standards. The brief called for a concrete substrate with no softfall, requiring the tall sculptures to be designed as unclimbable, but still inspirational and with great visual impact. Natureworks is renowned for its exacting replication, to museum standard, of all forms of animal art; however for the Yeppoon project Natureworks branched out beyond its traditional realm of realism and ventured into the world of abstract contemporary art. Each sculpture created for the sprayground was designed with a 75-year lifespan. They incorporate stainless steel armatures, reinforcing heavy-duty polymer-modified 75mpa concrete, to withstand strong weather conditions. The solid forms were then overlaid with a bronze sealife appliqué and colourful mosaics to provide a spectacular surface finish. The hero piece of the Yeppoon series is the ‘Keppel Kraken’. At a height of 4m, this central sculpture towers over the other elements, periodically dumping an avalanche of water over the unsuspecting children below. An additional series of intermittent spray and jumping jets of water add more surprises and a ton of fun to this magical sea-creature inspired sprayground.